The base's history started in 1940 when the US War Ministry made a survey study to locate a suitable place to install a permanent base in Bermuda, then a strategical point for the US as well the United Kingdom: both countries were looking for a mid Atlantic air base. Once choosed the place, the construction begins in 1941 and would endure several months. 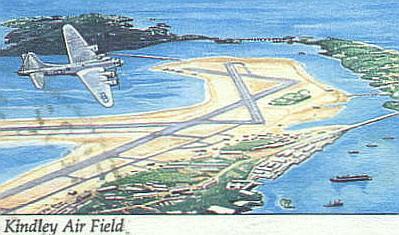 In 1943 the first air facility of the army located in the St. David island started operations under the name of "Fort Bell". Being transfered subsequentelly to the Army Aviation and then to the newly formed US Air Force being renamed as "Kindley Air Force Base". From there during the WWII operated planes from US, UK and Canada and after the war the base was home for advance reconnaisance, meteorological and search and rescue air units. At this time Kindley was a key point in the marine defensive scheme of the US east coast. In the late 50's, the base was a middle step for all the cargo and transport planes doing the southern route to Europe, Africa and Middle East, so a unit of refuel planes KC97 were stablished permanently there. In 1957, along with the normal operation of the station, were done several studies related to hurricane tracking and prevention using among others instruments, stratospheric balloons of a special kind, wich were launched from planes departing from Kindley. Also in the next decade there are some indications of superpressure balloon launches performed from there. These last balloons were capable of stay aloft by weeks at the same flight level thus being used to map the wind currents in the north hemisphere. Finally in 1962 the base would be used also to perform rocket launches using small vectors like the Arcas, Deacon and Viper. These kind of experiences would be sporadic during the rest of the decade. In 1970 it was transferred to the U.S. Navy, operating until 1995 as USNAS Bermuda when it was closed and the installation was taken by the local government. Years later, Kindley Field was used to stablish the Bermuda International Airport.